Oh sweet Pinterest! Who knew what a huge impact you would have on social media! I sure didn't. When I first signed up for my pinterest account, I didn't have time for it. Let me rephrase that... I thought it was a waste of time. Oh was I wrong! I'm going to stop right here for a moment... if you don't have a pinterest account, go to my facebook page right now and request an invite. I will send you an invite asap! I'll need your email address but I promise... I won't use it for evil. First let's talk profile. Make sure your profile is filled out completely. Name, an "about" that's fun, and don't forget ALL your links! People DO look at that. Is your profile picture your face? If not, make sure it's interesting and eye catching. Right now mine is a variation of my logo but as soon as I have my picture taken, that will replace it. People like to follow people. Make pinboards that reflect your style AND the style of your target market. You want to catch the eye of the people who buy your product. Give your pinboards a good name and make sure you fill out the description too! I'm working on that part right now. You should also categorize your board. You can do all this when you hit the edit button for any of your boards. Have a pinboard for YOUR creations. Let people know in a non spammy way that this is what you make. You can pin right from etsy. When you do, a little corner banner pops up with the price of the item and the description in the link. Personally, I remove the banner. I've seen many people complaining about the "etsy spam" they see. I don't want people to unfollow me because they think I'm spamming. If they are interested, they'll look and repin whether or not the price is in the corner. Make a pinboard for your blog! That's right, you should pin every blog post. Use a graphic in your post that you'll be able to pin. Make sure it's something that people will want to repin... make it pinterest friendly. So if you're having a sale or giveaway, make a pretty graphic and pin it to your board! You could even enter the people who repin it into a special drawing. Use your imagination! Don't forget about other ways of promoting your pinboards! You can link and post your pinboard in Facebook. I did that today as an example with my "hearted" pinboard. You can tweet your pinboard. 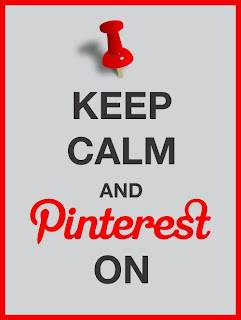 Just tweeting the word Pinterest attracts people! Share your pinterest link everywhere. If you do this consistently, you will get traffic. When you repin something, you have the option of changing the text beneath it. I usually try to do that. When you repin, that person gets an email telling them that you pinned something and then gives them the text that YOU put in there. They might click on it to see what it is you repinned. My very first newsletter is coming out next Tuesday, you won't want to miss it! I'm giving out even more social media info that you need to know to boost your online presence! First newsletter coming out? Oh yeah, I just signed up!!! So many great tips Kelly. I need to do some work on my boards over the weekend. Signed up for your newsletter as well. Nice post. I love pinterest too! Great tips! Great tips Kelly! I have been loving pinterest for some time now thanks to you, and am proud to say I am now an addict! I also need to work on board descriptions! This is the kind of info I've been looking for. Thanks for sharing!